Leads App manages all your business and sales leads. Businesses gain access to sales leads through advertising, direct mailings and other marketing sources. The sales process begins once a sales lead is identified, qualified and placed into a company’s sales pipeline. The lead’s contact information is used to make outbound sales calls, send sales e-mails and provide direct marketing material.The quality of the sales lead depends on whether the individual or business was motivated to provide its contact information. Leads App doesn’t support your business with leads; it comes with many other apps to run your business. All apps are deeply integrated which communicate with one another. The qualified leads can be converted as contact, customer and/or opportunity. First Name- Name of the lead. You are allowed to enter in your own language in “First Name” text field. Last Name – Name of the lead. You are allowed to enter in your own language in “Last Name” text field. Job Title – job title of the lead. You are allowed to enter in your own language in “Job Title” text field. Best Way To Contact – Way of contact lead through Email, SMS & Telephone. You can choose any one from “Drop Down” box. Referred By – Referrer of the lead. You can choose referred person from drop down list with click of “Search” button. Assigned To – Assigned person of the lead. You can choose assigned person from drop down list with click of “Search” button. Description – Description of the lead. You are allowed to enter in your own language in “Description” text field. Tags – Tag of the lead. You are allowed to choose tags from “Drop down” box (or) Create a new tag with click of “Add New”. Lead Status – Status of the lead, the value can be selected from predefined list. Type – Type of the lead, the value can be selected from predefined list. Phone – Phone number of the lead. You are allowed to enter N no of digits in “Phone Number” field. Email – Email of the lead. You are allowed to enter email id in “Email” text field. Skype – Skype name of the lead. You are allowed to enter Skype name in “Skype” text field. Additional Information of the lead. You are allowed to enter “Additional Information” about the lead in your own language. Potential Amount – Potential amount of the lead. You are allowed to enter “Potential Amount” for lead in USD. Campaign – Campaign of the lead. You are allowed to create new campaign with click of “Add New” or Select campaign from predefined list with click of “Search” button. Territory – Territory of the lead. You can select territory from predefined list with click of “Search” field. Market – Market of the lead. You can select market from predefined list or create new market with click of “Add New” in drop down box. Rank – Lead ranks which are meant for prioritizing the leads. Select the value from predefined list. Segment – Segment of the lead. You can select segment from predefined list or create new segment with click of “Add New” in drop down box. Company – Company of the customer. You are allowed to enter in your own language in “Company” text field. Industry – Industry of the customer. You can select industry from drop down list or you can add new with click of “Add New” in drop down. Ownership – Ownership of the customer. You are allowed to enter in your own language in “Ownership”. Website – Website of the customer. You can add website URL in “Website” field. Address Type – Address type of the customer. You can select type of the address with click of”Drop Down” box. City – City name of the customer. You can enter your own city name in “City” text field. Country – Country of the customer. You can select country from drop down list. Zip Code – Zip code of the customer. You can enter postal code in “Zip code” field. Facebook – Facebook URL of the customer. You are allowed to enter the Facebook email address in the “Facebook” field. Twitter – Twitter URL of the customer. You are allowed to enter URL in the “Twitter” field. LinkedIn – LinkedIn URL of the customer. You are allowed to enter URL in the “LinkedIn” field. Create Lead – You can create lead by entering pertained information in the appropriate fields through creating the lead page. Click on “Create & New” button to save and continue creating new leads or Click on “Create” button to view lead information. All Leads – You can view all leads by clicking “All Leads”. 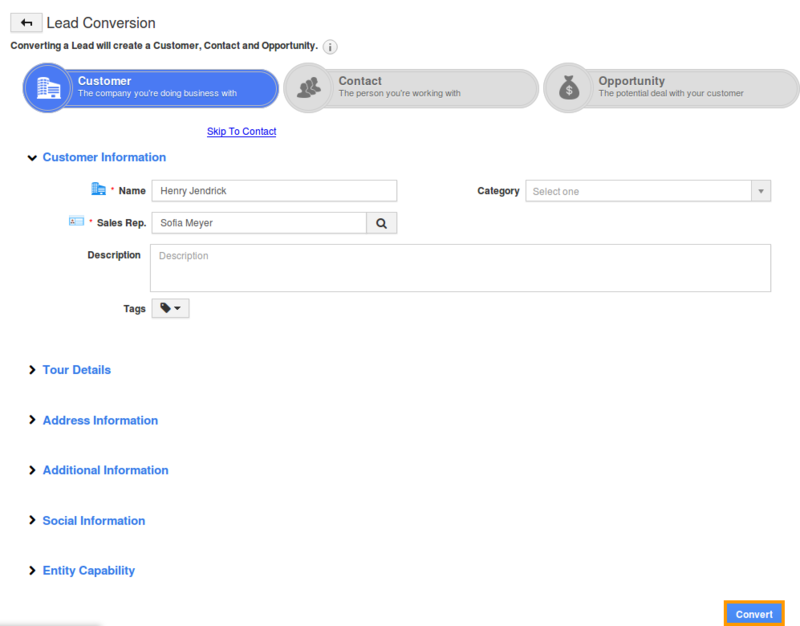 Recently Created – Recently created leads will be displayed. By Queue – This menu expands to show a list of leads assigned to you, to your employees and to your teams. Directory – This menu expands to show all the leads. You can custom view the leads by selecting particular letter. To Follow Up – This menu expands to show leads that are to be followed by you. By Status – This menu expands to show leads from different statuses. By Market – This menu expands to show leads from different markets. By Source – This menu expands to show leads from different sources. By Rank – You can view the leads by their priority. By Territory – This menu expands to show leads from different territories. My Views – The custom search of leads can be saved as views. Shared Views – The custom views shared by other employees to you. Quick Links – You can view the saved related links for quick reference. The lead dashboard speaks about the people’s activity and able to filter the activity by their name. At once you click the employee name from “People” drop down you can view all the related activities of selected name. And on the right recent leads created by employees are displayed with the type, and date of creation. The news feed displays all the leads related activity, for the convenience you can filter the people’s activity by choosing their name. At the top of the Newsfeed the field called Filter Feed, by which the activity according to the selected name. Choose the employee name by clicking “People” drop down, select the employee name you would like to view for. You can type your own comments in what are you working on? Editor folio and post them. You can seek the News Feed by search Newsfeed above the post folio. This is the master header will follow through every page so you can easily redirect to home, reports and more. It redirects to the homepage of leads. You can quickly view recently created leads. 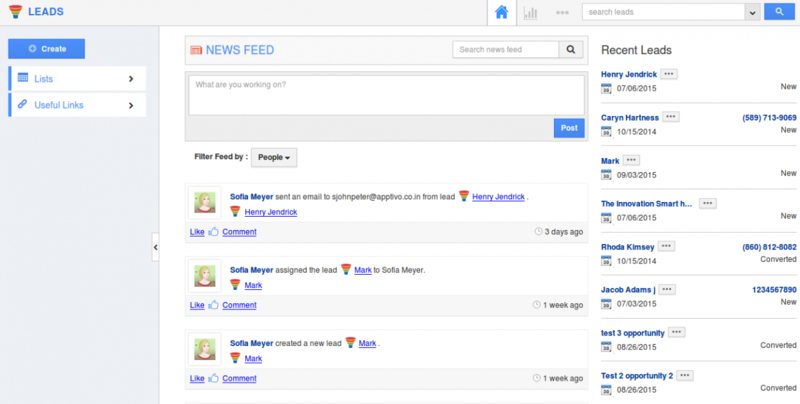 It is used to offer a Newsfeed related to the Leads App. They also provide the link to the individual along with the integrated apps. This is due in part to the communal nature, focusing all the integrated apps, as well as the ease of creation. Leads App reports support you to keep track of important information in the name of the reports. The report uses a feature of exporting into excel format, sharing the reports with employees. A leads configuration enables to frame leads with perspectives you need to record as per your requirement. Leads have covered with settings, which attained with such qualities. The Leads App is powered by the global notification system in apps. This system allows you to receive updates to your news feed as well as email updates for many different events that can occur within the app. Each employee can configure their own lead notifications set up. Being a collection of methods that are often incorporated in many diverse settings in various ways, there are documents and notes that are used to utilize the need of News Feeds and Email Feeds for communication. Trash feature is an enhanced feature which supports you to restore all the deleted leads. All the leads that were previously deleted are now available in the Trash. Leads App provides an extraordinary section of recent leads which displays all the leads created and modified recently, with their type and date of creation. Quick view of lead type and creation date. You have leads coming in from a wide variety of sources. Some leads come from lists you acquired, others from a webform on your website and still more from the ‘Email to Lead’. CRM Management module helps you organize leads and assign them to a sales rep so they can be followed up on and qualified quickly. Log in and access Leads App from your universal navigation menu bar. Click on “Create Lead” button from the left navigation panel. First Name – First name of the Lead. Last Name – Last name of the Lead. Job Title – Name of the job. Best way to contact – Choose option for contact. Lead status – Select lead status from a predefined list. Lead source – Select lead source from a predefined list. Referred by – Select name of the referrer. Assigned to – Select an employee/team. Description – Description about the lead. Tags – Select existing tag/ Add new tags. Phone – Phone number of the lead. Fax – Fax number of the lead. Potential Amount – Enter amount in USD. Estimated closed date – Choose closed date from calendar picker. Campaign – Select campaign from a predefined list/Add new. Territory – Select a territory from a predefined list. Market – Select one/Add new. Segment – Select from predefined list. Category – Category of the lead. Customer – Name of the customer. #Of employees – Number of employees. Annual revenue – Annual revenue of your company. Industry – Select name of the industry. Ownership – Name of the ownership. Website – Name of the website. Address Type – Select address type from a predefined list. Enter other address information like city, state etc. Click on “Add More Address” to add more addresses. You can automatically create leads when a customer emails you for support. You can use email ids or aliases to receive emails from your customers. In order to receive emails in Leads App, you need to authenticate your email address in IMAP settings. Port – port number of the domain for example: port number for Gmail is 993. Assigned To – Select an Employee to whom it should be assigned automatically. Once you’ve authenticated your email address, all your receiving emails will be collected as leads in leads App. You can use Google Forms to create customized forms that can be used to collect data, such as contact information from interested prospects visiting your website. Once the user views your form and submits with their data, it is stored inside of a spreadsheet in Google Drive. Leads App allows you to configure a Google Form to create a sales lead in the Leads App. When creating your Google Form, you will enter a special script we provide, which will connect this form to your account. You will need to have a plan, including API access, as this feature will use your unique API key and password inside of the special script. 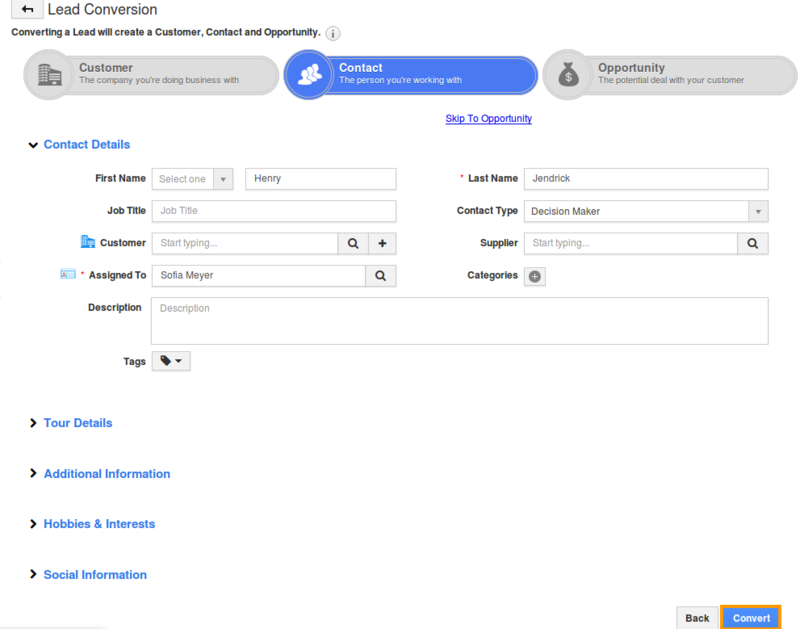 In order to support the rest of the sales process, it’s time to convert the qualified lead into a customer, contact and opportunity, this conversion feature allows you to read all the field values. The conversion of lead into a customer makes it possible to achieve the aims of the business. You can convert a lead into a customer, the standard and custom fields are automatically converted into the customer that will be associated to the customer. Create a new lead or select an existing lead to be converted. Click on “Convert” button and start the conversion. You can convert a lead into a contact, the standard and custom lead fields are automatically converted to the contact that will be associated with the contact. Click on “Convert” button and start conversion. In order to support the rest of the sales process, it’s time to convert the lead information into the other CRM apps. The conversion of lead into an opportunity in order to fulfill the need by applying the method to fulfill and benefit. The standard and custom lead fields are automatically converted to the opportunity. You can also convert this lead into a customer, contact otherwise skip to opportunity. Provide opportunity information and specify close date which is mandatory. Removing leads from Leads App revokes access for every app, before you delete leads, consider removing the associated objects with other apps. If the lead is associated with any other object, then the lead will be moved to the “Trash” folder. If the lead is not associated with any other object, then a lead can delete forever, Click on “Delete Forever” button. Select leads you want to delete, If the lead is associated with any other object, then the lead will be moved to the “Deleted” folder in the trash. Leads that are associated with other objects will be found in “Archived” Tab. After you delete a lead, you can restore it. If you permanently delete by removing all association you can’t restore it. In most leads, restoring a deleted lead also restores the lead’s associated data, including synced email, calendar events. Select leads you want to restore from “Deleted Leads” tab. Click on “Restore” button to restore the leads. Select the lead you would like to delete. Click the delete forever button in the toolbar above your leads list. (If you have the leads open, you can also delete by using the same “Delete Forever” button). Select the leads you’d like to delete and click on “Delete Forever”button. Or select all leads using the check box found in leads list header. Collaboration is setting which includes all the common features, this may allow you to give access for your employees to view the common activities found in app. Leads can be converted into opportunity, customer and contacts depending upon the conversion settings. Conversion page can restrict the objects to which leads can be converted. It includes opportunity, contacts and customer. Customize App provides common features of Leads App. These are like business attributes which supports you to customize your business with the custom fields. They can be quickly and easily added for customization. Leads App allows you to add any custom fields that aren’t provided on the creation page by default. You can collect leads when a user emails you. You can use email ids or aliases to receive emails from your users. If a user sends an email to authenticated email address then he will be collected as a lead with his email address. Employees range indicates the number of employees working in lead’s concern. Click on create button to create employees range. Google Forms Integration allows configuring a Google Form to create a sales lead in the Leads App. When creating your Google Form, You will need to have an API access, as this feature will use your unique API key and password inside of the special script. It provides script to be used, while capturing leads using Google form. Just copy script from this API access and paste it on Google form script editor to generate a lead. Industry plays the major part of the population. Here you’ve provided with frequent industry that may be relevant to your business, for example: Aerospace & Defense are an industry, you can create the lead related to this, which may be applicable to your business. Lead ranks is a method to organize the priority of your sales leads. By default you have some basic priorities (low, med, high). But if you have a lot of leads coming through your system, you may want to add additional ranks to help classify leads with more detail. Similar to the lead status, lead source is another attribute that can be assigned to a lead. Customize this list based on where you acquire leads from, helping you understand which lead channels are the most effective. Every lead will be assigned in a status when created.Here you can adjust the statuses that are available within the app. To disable an existing status, click the edit button, and then set the end date to today. You can also add additional statuses by clicking the create button in the upper right corner. A market is used to define a specific group of potential leads, who share common traits. Typically you will divide your leads into markets which allow you to easily segment efforts and apply the same/similar tactics for the entire market. Message Templates will allow you to set up predefined messages. Message templates are customized email messages that you can send to your leads. Message templates can be used with any email sent, and they are also used for auto-reminders. A territory defines a geographical region which leads resides in. It may include regional or national level for larger businesses and city/state/country level for small business houses. You can add sales territory by clicking “Create” button in the top right corner. Leads App salutations allow you to create your own prefix for your leads needed for your business. This setting allows you to control the security of the leads app. When you’re looking at the employee data level access, a lead will only be visible to managers and the employee whom the lead is assigned to. If you select “All”, then any user with access to the leads app will be able to view all lead details. View Column Set – This feature allows you to customize your contact fields as a section as per your requirement. You can easily access your preferred section quickly to save your custom views. Views are filters that are easily accessible within the app, always found in the left menu. Views can be configured and set as per your needs.